There is more much more to this release though, the Sonos Playbar now switches properly from TV to Audio mode, the loading circles on the NEEO Remote look much better, the battery indicator has been reworked and much much more. Check the release notes below to not miss anything. Once the update is available it will show in your NEEO App on the top right with a red dot and an exclamation mark. You just need to follow the steps in the NEEO App and then on the NEEO Remote. We have prepared a little guide . Be aware that it may take a few hours until your NEEO shows the update, not all devices do download the update at the same time, so give it some time :). Patrick does this fix all the Sonos issues I’ve reported or is there still more fixes coming? I’m referring to scrolling content limitations to only a few pages, artwork image load slowness or not appearing at all and music library content not playing until a music service playing first. Raphael I read the post your referred to in your link. From a testing perspective, I can confirm the following, Artwork does appear more quickly but it is still nowhere the speed as you had shown in your Sonos demo done over a year ago. The same limitations still exist with only being able to scroll a few pages from any Sonos library view. Also, you still can't go Artist -> Album and see tracks. In order to play tracks you have to use the Album view from the start. I haven't tested playing library content yet but will do so tonight and report back. 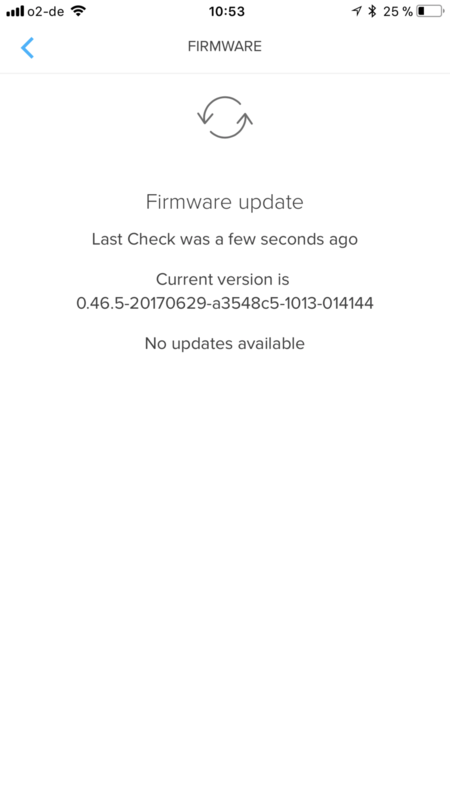 It sounds like this firmware update didn't include any of the Sonos issues I had reported but maybe they are coming in a future firmware update. Please confirm. After the update, can I allocate Z-Wave devices to other rooms than just the first one? If your NEEO is the primary controller, you can assign a Z-Wave device to any room when you add the device. Paul Spee I also have this problem. In my case NEEO is a secondary controller. It's going to be a pain to exclude the device and include it again. The option to allocate a device to an other room would be a great option to include in NEEO. When NEEO is functioning as a secondary controller, discovered Z-Wave devices cannot be assigned to a room. This is a limitation of the current firmware which will be addressed in a future firmware release. I know, but since my NEEO is the secodary controller, that does not work. About a month ago it was already known that it will be implemented in a future firmware. Hence my question. Roger Bösch Did you allready opened a Topic about the missing device? this is the best you can do. Also mention Andy (@ Symbol and then the guy with the black and withe Picture). He is responsible for integrating devices. But currently he is on the Airplane flying back fram San Francisco to Swiss. For this reason it can take until Monday to get a reply from him or the device is added. In such a Topic like that, such requests cen be overseen. Your device LG 40UH630V is already supported. Let me know if you have any issues with controlling this device! Is the best way to add Sonos one to delete my current sonos play 1 (a dummy designation to connect the sonos one) and add a new device, or is there a way to switch it? Tyler Pruce If it works there is no need to remove and re-add your Sonos device. Can you please give an example of how the HDMI control works? It would take an HDMI port on the TV I assume. What would be shown if the TV is switched to that input? Tyler Pruce Just connect the Brain with a HDMI cable to your AVR or TV. There is no audio/video output from the NEEO Brain - so you will see most probably a black screen. Frederik Vancoillie With the new release you should see a lot of improvements in that field. That being said, the size limitation of certain lists is a known issue and high up in the priority list. PS: Some further speed improvements are also to come (even though it already is the fastest remote on this globe) Thanks for being here! Raphael I don't see any improvement, really. I do however maybe have a somewhat different setup. I'm still using a Sonos Bridge and all my Play 1's are setup as stereo pair, connected wireless to that bridge. All my music is on a NAS. When I pause using the app (NEEO or SONOS) or via the Sonos on top of the Play:1 it takes 25 seconds until I see it being paused on the remote. If I do the same on the remote however, I can see the status change in the app almost instantaneous. The experience I saw from clips taken at ISE where scrolling through a list of music with album art is something I don't have. The album art only loads when I actually select something. All in all though, I can see the potential of the remote. It's a solid and beautiful piece of hardware and the unboxing experience was the best I ever had!! Frederik Vancoillie Raphael I do see an improvement with both artwork loading time and responsiveness in the Sonos control. However there are still some serious delays. Sometimes the now playing screen is up to 30 seconds delayed (both text and album art) when changing track. I've restarted the iOS app after update but renaming a room still looses the icon. Brain is updated but remote does not update. Neither does it recognize that the brain is updated. The result is that it doesn't work at all. Anything I can do to reconnect these or do I just have to wait? Soo psyched for this update! Big hope .. big disappointing. Sonos can't still use ... As long as I can not browse my library it's useless. Does this fix the problem introduced in the last build that caused WiFi to disconnect on a hidden network? Keenan Hinz I will check again with our engineers, would be really cool if you could give it a try though. I think currently we have not actually made a change for WiFi in that region, but we had neither in the last update. So we are still looking for the cause of the issue. Patrick I tried by making my wireless network not hidden anymore and was able to connect the NEEO to the WiFi network without any problems. I then disconnected the LAN cable and then hid the network. After my wireless router booted back up the NEEO was no longer connected to the WiFi network so it looks like this is still a problem. The Firmware version two releases ago did not have this problem. For now I have left the LAN cable connected to the NEEO. Nope, nope, nope, nope, NO! Seriously what's it going to take to stop this stupidness??? who, what, when & where do any of your engineers find this necessary?? Users sure as hell don't. Geoff Gautier It is stupid until there are Discrete codes for Power ON and OFF (like in your case) also this comes into view, when you have no discrete Input selection COdes avaialble! 1. If you are able to provide Discrete IR Codes, then they can be implemented. Sometimes codes can be found via google, sometimes asking the manufacturer can also help. 2. If any other Button (beside the Power Button) switches on the Device, then the Device driver team can program a Makro to be used. Therefor they need the other KEY that powers the device and the Time that is needed by the device to be able to react to power toggle after power on. other ways to unstupify the device is the use of Bluetooth or TCP/IP Control if available. But this requires a Bluetooth implementation in your device and NEEO. The TCP/IP Control can be done via the SDK. Hope this Info helps a bit. Markus Mahr do people just not get this??? I don't care or NEED a discrete code, I don't even care if I had to walk over and press a power button on the actual device. I have an always on box. I need nothing but to unstupidy the remote from making me hit extra buttons / actions to do.... wait for it...Nothing! Seriously the descrete code thing is like saying "Squirrel !" It grabs everyone's attention, but isn't the problem. 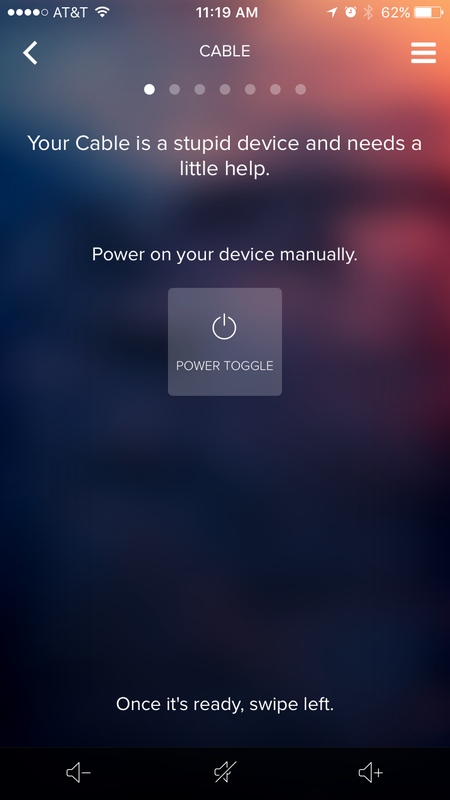 Refusing (out of spite at this point) to just no provide a non-descrete, non-stupid power toggle via receipe option (or anyone else's stupid problem) for a "smart" remote is moronic. Geoff Gautier Sorry i don't get that Info from the Post above, only had seen the picture showing the Power Toggle. If i' found right that your device is the comcast x1? If so, the only requirement is that Andy needs to change this device to an always ON in the Database. Currently he is flying from San Francisco to Swiss, and it can be that he then has weekend. Therefor it can take to monday until he can implement this behaviour. The requiremt from your side is to wait until the status was changed and then update your device and maybe perform a reset of the wiring to eliminate all rests from the brain. Geoff Gautier You can find the detailed info and engineering thoughts behind this here. I personally prefer reliable over assumption but there are certainly people that prefer the other. We had some active discussions going on here on Planet NEEO and absolutely understand where you are coming from. At the end of the day our goal is to only have setups that rock. We listen to the everyone among this community and we heard some good arguments for a "assumption mode" versus our "power toggle screen" solution. Due to that feedback we plan to implement this as adoption the user can choose. Also there is a cool sort of "device smartener" feature planned via CEC. What we are coming up with on the CEC side will be a lot better than any of all the bad toggle options in the market as there is a true status available via CEC. Basically a majority of devices that are "stupid" in any of the competitors product will be made truly smart. The couple of devices that will then still remind stupid (very few) can either be handled the robust-but-one-additional-click-NEEO way or with toggle commands (an upcoming "assumption mode" including state awareness). Hope this helps. Thanks for being here! Geoff Gautier We agree with you and I believe you will like the options we are working on. Gracias! Geoff Gautier This is what I need. NEEO, please ignore my stupid audio device, I always keep it on. Don't nag me with the power on/off screens, and don't stop running my recipes. Patrick you may want to update your guide to include steps for the remote. I updated mine but found the visual queues lacking. I kept hitting the update button but it didn't appear to be doing anything. I then noticed a very tiny downward arrow in the upper right part of the screen. I figured out this meant it was downloading. brad kramer Yes you are right, that should provide better feedback. I have filed a story for that one. = "Looking for unicorns" label while switching off recipes? But to be unsilly: this message is in the Software as space for something that was not Implemented, there are also other beautiful Text-Phrases that can appear! Silvano Cunha witch one did you find? beer or other? Markus Mahr probably the most easy one if you hear about it... if you grew up in the early 90ies you probably know what I'm referring to. The other one which I'm yet to find is the animal thing, also something from the 90ies ;-). Trying not to spoil too much in respect to the developers... Haven't heard about anything related with beer though. Silvano Cunha Yeah, the 90's think allready also found, but now i know that there are at least two more... There is definitly something about BEER! That was posted by Raphael in on of the Blog Posts! I've only got my NEEO on Wednesday and this is my first update 😁 The Hue bulbs switch on/off way faster now! But on my Sonos (Play 1, no bridge), the album art in the queue still does not load 🤔 The cover art for Now Playing seems to work more reliably now. Alexander Graf just to add, I'm running the latest 8.1.x (I think) Beta of Sonos. The album art in the queue does load on the NEOO remote but it takes more than 5 minutes for all the covers to show up. I think a lot of the “issues” are just down to expectations. With a product that looks more expensive than a 700$ iPhone, people (including me, I have to admit) just expect that it performs as smoothly as an iphone 😅 not thinking about the hardware and type of CPU that powers NEEO. What I’m saying is, subconsciously we compare it to an iPhone and not to other remotes. Any way to get access to the Beta? Raphael Patrick okay. Just got home and did some testing on Sonos. First the good. The app on iOS is much better. Music plays reliably. Artwork loads better but could still improve. It definitely isn’t as fast as your working demo from last year. As to what isn’t so good, you can’t play individual tracks unless you start at the album or track level. If you start at artist level you can only drill to album. I’m hoping this is a quick fix. The remote has problems in addition to the one above. The main one being you can only scroll a few pages of content so most of the library can’t be accessed. Artwork load time is at least 3X slower. The remote is basically not usable at this point. Hoping these fixes are coming in the next release. Feel free to reach out if you want more testing. FYI - the app looks great on the iPhone X.
brad kramer Thanks for the feedback. Happy iPhone X user here as well ;) the artwork speed will become faster over time. It's ongoing improvements in the image decompression and other optimisations around this. We will certainly inform about this in the release notes of the firmware update that addresses this. Also the point with some lists not being displayed in full is a known issue and will be addressed shortly. Thanks for being part of NEEO! Raphael thanks for the quick feedback. Sounds like you are very close. Keep up the good work. Alexander Graf Actually, my expectations are based on a $100 Harmony remote. Given the retail price of a Neeo is many multiples of a mid-range Harmony, I would expect something at least equivalent in functionality and reliability. Especially given the number of extra years they have had to work on the software. Walk without rhythm, and you won't attract the worm! as a long time Harmony user, only thing I can say is that the Neeo is way better in every aspect. It Still needs work though, Since it’s far, very far from perfect. Update went well but after the unicorn message remote stopped working. Karl Smith Did you try to hard reset the remote? Holding power for more then 10 seconds and reboot it? Did it have ne communication? THen maybe a repair would fix it, power off the remote and during power up, hold back and power until you see the FTUE screen. Next problem. Neeo link was very rare before now it's nonexistent. Karl Smith Can you first check if NEEO Link is still enabled in the App? I recommend to repair the NEEO Remote with the NEEO brain when you have issues with NEEO Link. You can do so by turning off your NEEO Remote, and then hold "Power" and "Back" until the NEEO Remote has booted, then follow the instructions from the NEEO Remote. Patrick ok thanks ill try that. Markus Mahr Patrick Update: saw the unicorn again. Locked up the remote again. Which caused wife to yell "i hate this remote". How do i kill the unicorn? Hi there, I tried it several times already but my brain does not offer any update. I am online and the check still talks about the previous version and that there is no update available. What is wrong? Marc Strassner try a restart of the Brain. This should help. If not, reply again please. Marc Strassner then somebody of NEEO should be involved. I will pull Patrick Emily Jeff Raphael in. But don't know witch is working on weekend or not. Maybe you will get an answer by Monday Swiss hours. Marc Strassner Can you let me know your NEEO-Host (int the NEEO App in the about-section within the settings), then I can have a developer analyze this specifically. As for the moment, I would recommend another reboot, your NEEO should have downloaded the update by now, once you reboot it should be shown. Just got my neeo and set up. Everything was great but I am also stuck at 0.45 without any upgrade offering. Have tried power cycle the brain a couple times and nothing has changed. Any other trick I should try? It may take some time before the update becomes available. I recommend to let it sit for a while. Paul Spee thank you. 6 hours has passed and my neeo still think 0.45 is latest greatest. It even have recent check 11minutes ago. Doesnt sound right to me but I’ll give it couple days more. It eventually does offer an upgrade. Esffectively had to wait overnight. Raphael Patrick it’s been 4 weeks since the last firmware update and major Sonos issues haven’t been corrected. I’ve asked several times for an update and was told early on that fixes were coming soon. Sonos essentially doesn’t work on the remote. All I want is for it to work as Raphael posted in a demo early on in the campaign. Please provide an update. I’ll continue to offer my time as a beta tester if having additional resourcing is contributing to the delay. Raphael thanks for the quick response. Do you anticipate I release before EOY? Andreas Coradi Raphael I was just going to post the very same and offer myself as Guinea Pig (or my remote, that is) Currently I am not afraid to break anything as I don't see it fir for my real life purposes, so if you are looking into more people testing the crap out of it on various configurations, count me in. Possibly you could create a programme like e.g AVM, Firefox, QNAP etc which offer to choose subscribing to beta or regular firmware update channels. Raphael Patrick gents, any update on the timing of the new firmware? I would really like to know how the testing is going. There is one thing what I can't hear anymore : "Stay tuned!" It took them 2,5 years to provide us with version 0,45, which allows us to control a TV, as long as it is not stupid. Not difficult to estimate how long it will take to reach version 1.0 to be able to do stuff like IR learning. Lets hope for Version 2.0 which will finally allow us to change the backgrounds. Or for a big annoucnement Neeo 2.0, which we can fund via Kickstarter.